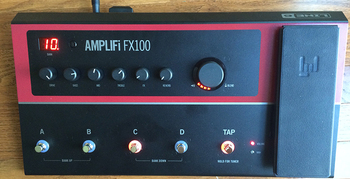 AMPLIFi FX100, Multi-Effects for Electric Guitar from Line 6 in the AMPLIFi series. 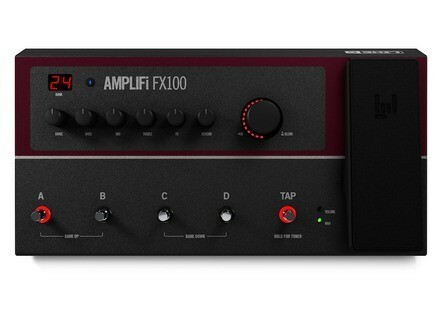 Following in the footsteps of the AMPLIFi 150 and AMPLIFi 75 amplifiers, Line 6 has released the AMPLIFi FX100, a floor-based multi-effects pedal controlled by your iOS device. How does this concept translate to a floor unit? Read on to find out. The solidly built, metal-encased AMPLIFi FX100 measures roughly 18” wide and 9” deep. The top panel features five footswitches: four that function as patch selectors within a bank, or as bank selectors to choose between the 25 onboard banks (you have to press two at a time to change banks, which is a tad awkward). The fifth switch does double duty as a tap tempo and tuner on/off switch. Above the footswitches are six encoder knobs Line 6 calls the Tone Controls. They include Drive, Bass, Mid, Treble, FX, and Reverb for the active patch. Like other digital knobs, you have to turn them until they reach their last setting before they become active. The FX control can be assigned to a single effects parameter for each patch, although not every parameter is eligible (for instance, delay time can’t be assigned). To the right of the Tone Controls is a large Master Volume knob which has a ring of indicator LEDs around it. When you’re adjusting master volume, the LEDs light up red. When you’re tweaking one of the six Tone Controls, they become white, with a red indicator that shows the knob’s current setting. On the far right of the unit is the Expression Pedal, which defaults to volume control, but can be easily switched over to wah duties by pressing down on the pedal to active its toe switch. Two LEDs next to the pedal indicate its status: Red for volume, green for wah, so there’s no guessing as to which state it’s in. Nice touch. On the top near the left is a small Bluetooth button, which flashes blue when you’re pairing the unit and stays lit once you’ve paired the unit with an iDevice, Bluetooth speaker, or laptop. The final item on the front panel is a two-digit LED display that shows you the bank number that the pedal is set to. The unit contains 100 patches, setup in 25 banks of four. The first 25 come with factory presets, and the 26th is designated for “User Presets,” but you can overwrite the factory patches if you want to, so you can save more of your own creations.. The back of the unit sports five 1/4” jacks: Guitar In, a Stereo Pair of Main Outs, Amp Out, and Phones out. The Amp Out sends a mono version of the output, and is designed for connecting to an amp or a DI recording input. According to the manual, the amp modeling along with the effects are sent to the Amp output. I found, however, that while it sounds great through an amp, it sounds less good direct. I got a much better DI sound using the two Main Outputs into line inputs in my audio interface. With the mono output connected DI, it sounded reminiscent of when you plug in an effect that has no amp modeling into a direct input: one dimensional and a little buzzy sounding. I compared it with the same patch, recorded DI through the Amp out and through the left Line Out, which is for mono signals. You can hear the difference here. As you can hear, the Line Out sounds more natural. I got the best DI recorded sound from the AMPLIFi FX100 when tracking in stereo. Other than the Tone Controls and volume controls on the unit itself, all the editing must be done in the AMPLIFi app. Unfortunately, that means that, at least as of now, Android users can’t access some of the most important aspects of the system. The AMPLIFi Remote app is powerful, but not particularly intuitive, especially when it comes to patch management. 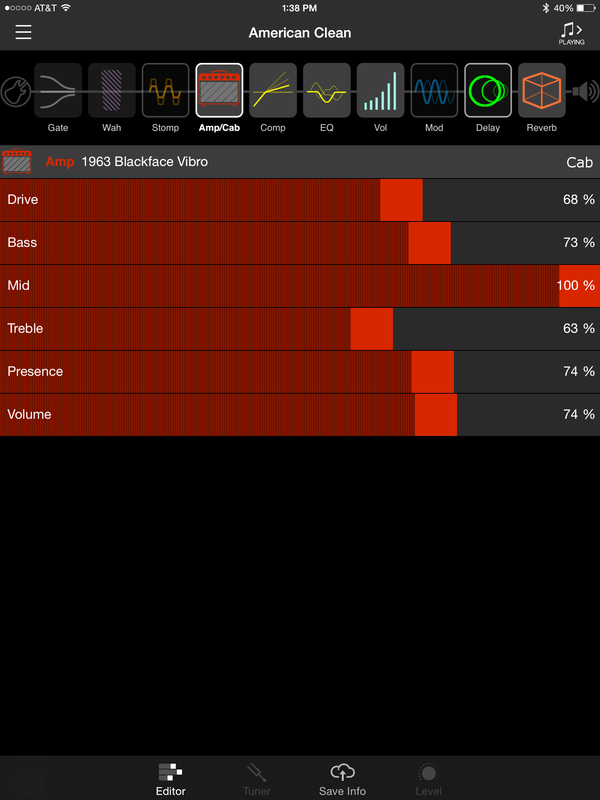 The Editor window defaults to the Amp/Cab view, which shows you sliders for each of the Tone Controls on the unit at their current settings. At the top are icons for the various effects and model categories, and you can tell at a glance if they’re active or not. These categories include Gate, Wah, Stomp, Amp/Cab, EQ, Vol, Mod Delay, and Reverb. The categories in which effects are turned off are dimmed, so it’s easy to see which ones are on in a given patch. Tapping an icon brings up parameter controls for the corresponding effects. Tapping on the name of the effect brings you to a new screen where you can choose from a huge range of choices for each effect category, or the amp and cabinet models in the case of the Amp/Cab category. Over 200 amp models and effects are available, which is impressive, as is the unit's ability to provide eight simultaneous effects. The Music Library section makes the music in your iTunes library available for playback through the hardware unit’s main outputs, and to any Bluetooth compatible speaker. 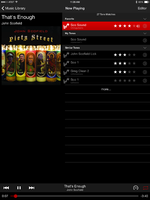 The idea is that it’s easy to jam along or practice with the tunes on your device. You can even have iTunes tracks playing in a Bluetooth speaker while you’re sending guitar sound to an amp. A half-speed playback button is provided for practicing, which slows your music down 50% without changing the pitch. One drag is that switching to another app on your iDevice stops playback, meaning you can't use it in conjunction with a tab or notation app (in our review of the AMPLIFi 150, which was done on a beta version of the app, prior to its final release, the reviewer felt sure that Line 6 would address that shortcoming, but it appears they have not). The Tone Matching feature is quite impressive. 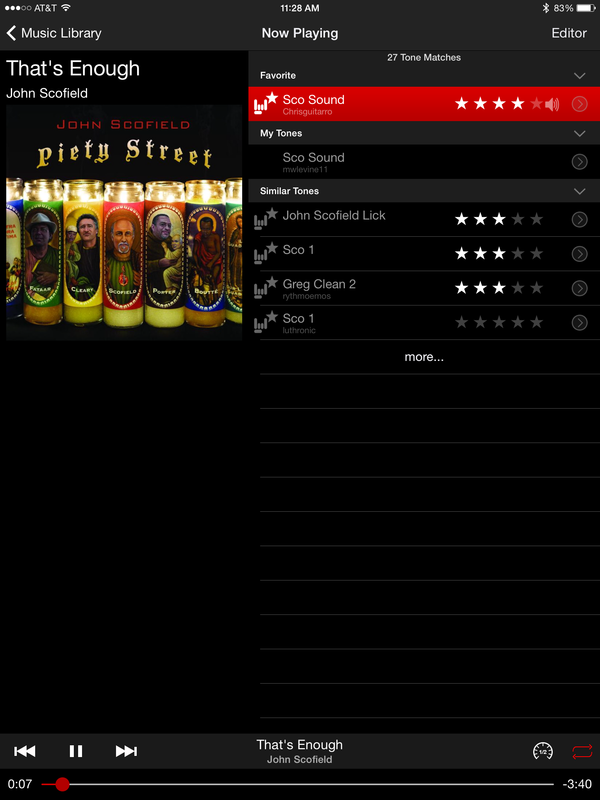 When you play a song from your library, you’re taken to a screen with the album cover on the left side (see screenshot below), and a column on the right that soon fills in with presets that the app has determined are a “match” for the song playing. It must work based on the metatdata saved with the song file, because I put in a non-tagged piece of music and no recommendations showed up. In any case, it does a good job of finding tones from its collection of user uploaded patches. You can use a patch as is, edit it, save it as a favorite and save to the hardware. You can also edit a tone and share it with the AMPLIFi community. The shared patches all have user ratings, which helps separate the good from the bad pretty quickly. Overall, it works well, and gets you patches that are at least in the ballpark of the sound of the guitarist on the song, which is very cool. 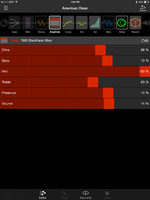 You can hunt for more tones by tapping Tone Search, which takes you to a screen for searching Line 6’s cloud-based collection of user submitted and factory presets. 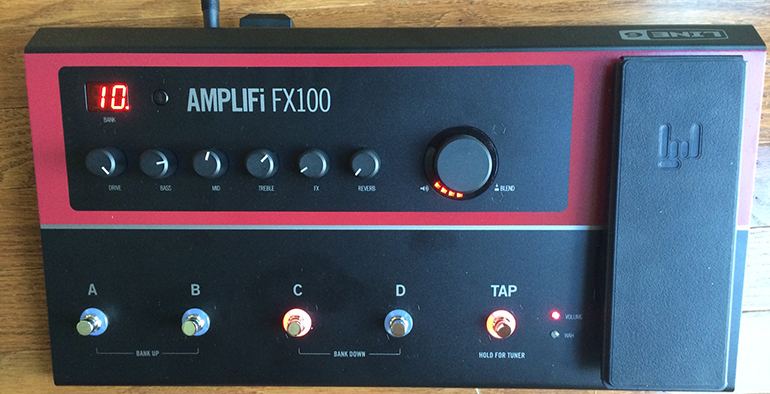 The AMPLIFi FX100 does very well as a practice and jamming tool, but what about as your effects processor for live playing? From a sonic standpoint, it’s certainly impressive and quite comprehensive. I especially like the distorted and crunchy tones, which although digital, are frequently warm and tube-like. And when it comes to effects, you can dial in just about anything you want. To give you an idea of how it sounds through an amp here are a few examples with the AMPLIFi FX100 connected to a Fender Twin which was miked with a Shure SM57. Here's the Class A-30 model (an AC30 emulation). I tried it out the AMPLIFi FX100 in rehearsal situations, and though I liked the sounds, I found the navigation a bit unsettling. Looking at the unit itself, you only have indicators for the bank number, (or if you’re tuning, the note being tuned), the volume/wah status, and which of the four patches within the bank is active. For any other info, and especially to know which sound is in which bank, you’ve got to use the app. That means you need to have your iDevice close at hand onstage. In addition, the FX100 doesn’t appear to have a “manual mode” like some other multieffects pedals, where the top panel buttons turn on and off effects in within one patch, rather than switching between patches. That type of functionality is more pedaboard-like and will appeal to many guitarists. Yes, you can tweak the tone controls and the single FX parameter assigned to the path with the front-panel knobs, but if you want to, say, turn your tremolo on and off at different parts of the song, you’ll have to create two patches and switch between them or reach down and turn a knob. 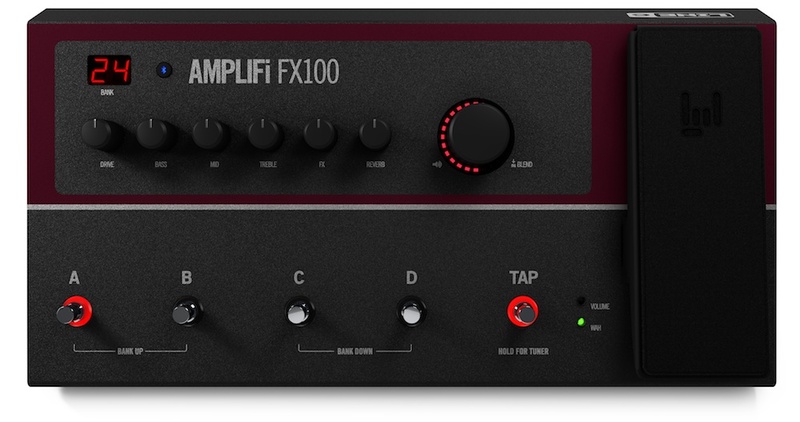 Overall, I liked the AMPLIFi FX100 ($299), and I was quite impressed with its huge variety of Line 6 amp and effects models. The Tone Matching system works well, is unique, and allows users to get involved withe the AMPLIFi community by contributing their own patches. For a practicing and jamming tool, I'd certainly recommend it, although the price is a bit high if that's all you're using it for. For performance I am not totally sold on the concept. The idea of controlling the unit with the app is a novel one and has some advantages, but I wish the hardware unit offered more visual feedback on its own. You want to be able to get around on it if your iDevice runs out of charge, or breaks, but without the app, you're quite limited in terms of parameter adjustment and knowing where particular patches reside.